I've been wanting to create an easy fingerless mitts pattern for quite sometime and now that's it done I'm excited to share it with you. It's also a quick knit making it great for last minute gift ideas. This easy mitten pattern is knit with two needles which makes it great for advanced beginners to try and for knitters that don't like knitting in the round or just want to change things up a little. Fingerless mittens are easy to make and with this pattern I wanted to include a thumb gusset in order to show you how easy it is to do. This way it will also give you an idea on how to knit mittens too. In fact you can turn this easy fingerless mitts pattern into full mittens quite easily if you wanted too. You may also like to try knitting these mitts together at the same time. That's how I knit these. All you do is use two balls of yarn and cast on stitches for each mitten, one ball for each mitt and away you go. What's good about knitting both mittens at the same time is they'll both be identical and once you're finished knitting you won't have to think about knitting another one. I like that. Materials: Any worsted weight yarn. 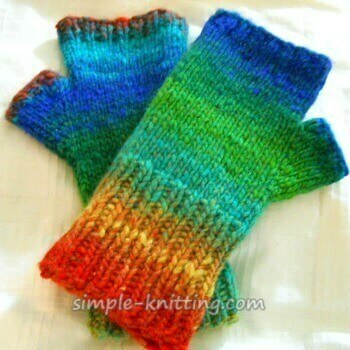 I used 2 skeins of Noro Kureyon #362 wool and knit both mitts at the same time. Notes: These easy fingerless mitts are fun to make and they're made with two needles. You can also make both mitts at the same time by using 2 skeins of yarn and casting on for both mitts using 1 skein for each mitt. This pattern is a way for beginners to learn how mittens are knit up and to learn how to form a gusset for the thumb. With size 7 needles cast on 36 sts and work in 1 x 1 ribbing for approximately 3.5 inches. You can make the cuff longer or shorter if you wish. Switch to size 8 needles and knit Stockinette stitch for 1 inch finishing with purl row. Row 1: K 17, place marker, increase 1 stitch (KFB) in next 2 sts, place marker, (there should be 4 sts between markers), k 17 sts. Continue knitting as above increasing 2 sts at beginning and end of thumb gusset until there are 16 sts between markers, 50 sts on your needle. Next Row: K17, remove marker and place 16 sts on a piece of scrap yarn or holder. (leave on holder and continue with mitt). Using the backward loop cast on 2 sts, and continue knitting the last 17sts. 36 sts on needle. Change to smaller needles US 7 (4.5mm) and knit ribbing for 4 rows. Slip thumb sts onto smaller needle (US 7) and rib 3 rows. Bind off in ribbing. Seam up the side of mitten and thumb. Knit up another mitt and enjoy!